The Los Angeles Chargers concluded the 2018 NFL Draft this weekend with four final picks. The four men selected Saturday to wear Chargers jerseys were West Virginia safety Kyzir White, drafted in the fourth round; UCLA offensive lineman Scott Quessenberry, drafted in the fifth round; Texas Tech wide receiver Dylan Cantrell, drafted in the sixth round; and Northwestern running back Justin Jackson, drafted in the seventh round. They’ll be joining others chosen in earlier rounds of this year’s NFL Draft. 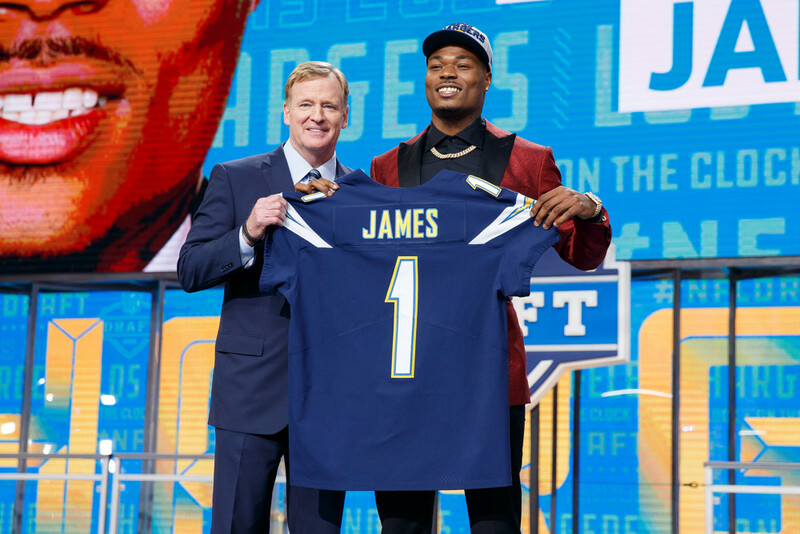 Previous picks were: Florida State’s Derwin James, drafted in the first round; Uchenna Nwosu, drafted in the second round; and Justin Jones, drafted in the third round. Immediately following the draft, Chargers officials also announced that they’ve agreed to terms with 21 undrafted free agents: Alabama’s Tony Brown; Georgia State’s B.J. Clay; Oklahoma State’s Zachary Crabtree; William & Mary’s Chris Durant; Clemson’s Marcus Edmond; Virginia Tech’s Brandon Facyson; Colorado State’s Zack Golditch; Eastern Washington’s Albert Havili; Houston’s D’Juan Hines; TCU’s Cole Hunt; Arkansas’s Bijhon Jackson; Kansas’s Ben Johnson; West Georgia’s JJ Jones; Nicholls State’s Tevin Lawson; Albany’s Anthony Manzo- Lewis; Western Carolina’s Detrez Newsome; Minnesota’s Steven Richardson; Grambling State’s Trent Scott; McNeese State’s Kent Shelby; Texas Tech’s Nic Shimonek; and Texas A&M’s Shane Tripucka. The team’s newest members may get some action as the team opens its 2018 regular season playing host to the Kansas City Chiefs on Sept. 9 at StubHub Center in Carson. The remainder of the seven-game schedule at StubHub Center consists of games against the San Francisco 49ers (Sept. 30), Oakland Raiders (Oct. 7), Denver Broncos (Nov. 18), Arizona Cardinals (Nov. 25), Cincinnati Bengals (Dec. 9) and Baltimore Ravens (Dec. 22 or 23). The Chargers will play the Tennessee Titans in London on Oct. 21 in what is considered a home game. The Chargers eight road games will be against the Buffalo Bills (Sept. 16), Los Angeles Rams (Sept. 23), Cleveland Browns (Oct. 14), Seattle Seahawks (Nov. 4), Oakland (Nov. 11), Pittsburgh Steelers (Dec. 2), Kansas City (Dec. 13) and Denver (Dec. 30).